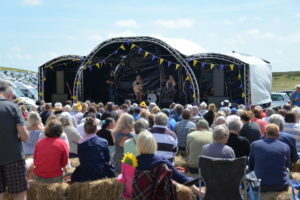 Mountbatten Sunflower Music Stage showcases some of the best musical talent on the Isle of Wight. There are live performances throughout the weekend from bands performing a range of different genres. The stage raises money for the local Mountbatten Hospice, so please give generously if you spend some time watching the bands and enjoying a drink from the bar.